As the sun goes down and the roar of another bustling day begins to soften, along the winding streets and corners of the city, the glow of the lanterns of the izakaya begin to turn on, inviting you to the refreshing comforts of a drink and freshly prepared food, for this is only the start of a magical entertaining night before another bustling day of work. Izakaya which literally means 'stay-in sake shop' (sakaya) are Japanese pubs where people can relax and enjoy freshly prepared small plates of food along with their drinks. 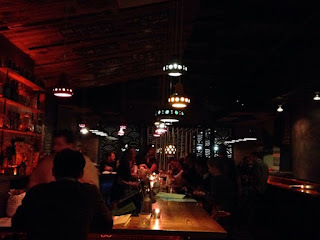 In the Western world, the izakaya would be thought of as a Happy Hour venue, where people come after work for cheap food and drink to relax after a day at work. 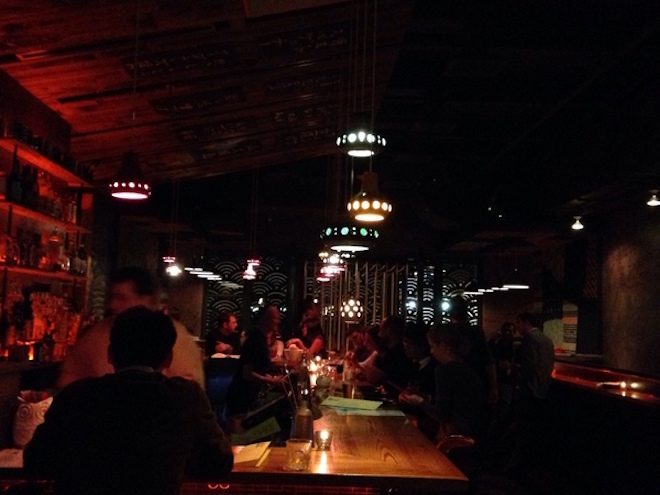 Izakayas vary greatly in style, price, menu and atmosphere. 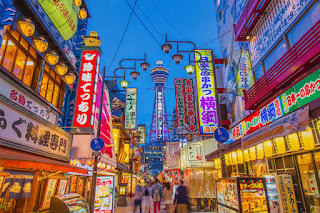 Approximately 1 out of every 5 restaurants in Japan can be considered an izakaya. The origin of Izakaya goes back as far as the Edo period (1603-1867). They began as liquor shops, where one could buy a bottle of sake and sit to drink it. Eventually food was added to menus and the drink lists started to expand with the introduction of foreign liquors. 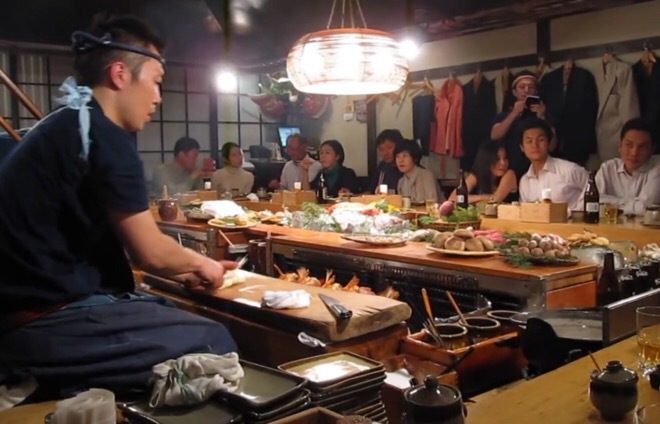 Typically at an izakaya, customers can see over the counter and watch chefs prepare the dishes. It is this closeness between the customers, the chef and the food that makes izakayas deeply rooted in daily life creating a community. People in Japan don't commonly have house parties, dinner parties or backyard barbecues; coworkers, friends and social clubs typically use izakaya as a venue for get-together and social interactions. Some izakayas have traditional private rooms with tatami mats, where you need to take off your shoes. These places are often used for big groups such as company parties. Traditional-style izakaya, which are called akachochin for their red lanterns, are usually smaller establishments that may play folk or traditional music. These shops tend to draw regulars from the surrounding neighborhood and are favorites among older patrons. There are also western style izakaya, which are more stylish and modernized to draw in visitors and the younger generation. Izakayas can also be found in many cities around the world. When you sit down at an izakaya in Japan, you may be given some small dishes and a warm wet towel before you order anything. Called 'otoshi' or 'tsuki-dashi', these are part of a Japanese custom to offer small appetizers before customers order; in no way are you being forced to order them. They are part of the cover charge which is added to your bill at the end of the meal. You can also judge the character and atmosphere of the restaurant's food from the contents of the otoshi. 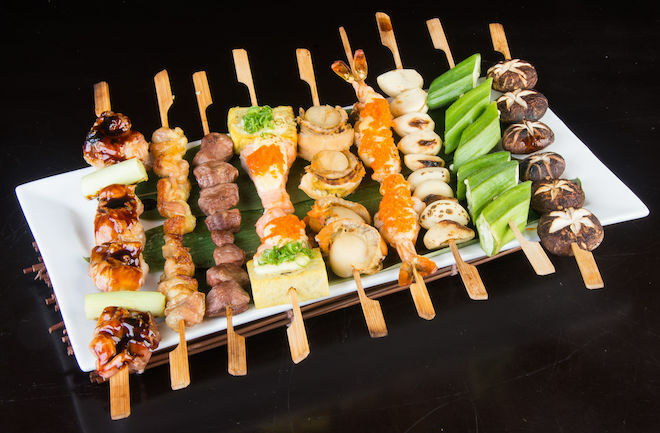 Most izakayas almost always have skewered items on the grill called yakitori (which includes chicken, meats, and vegetables on skewers), sashimi, sushi, tofu, stuffed peppers, soups and many other dishes traditional as well as modern.